Violife just totally get dairy free and vegan cheese. It’s cheesy, but I think Violife is grate. Ok, terrible cheese puns aside, dairy free cheese wouldn’t be the same without Violife. It melts like a dream, their selection is mind-blowing and it actually tastes like cheese. Trust me, there’s very few brands out there that can tick all those boxes simultaneously. Violife hooked me up with their full range so I could bring you my 7 Violife dairy free cheeses that Mark and I couldn’t live without. Bring on the cheese! 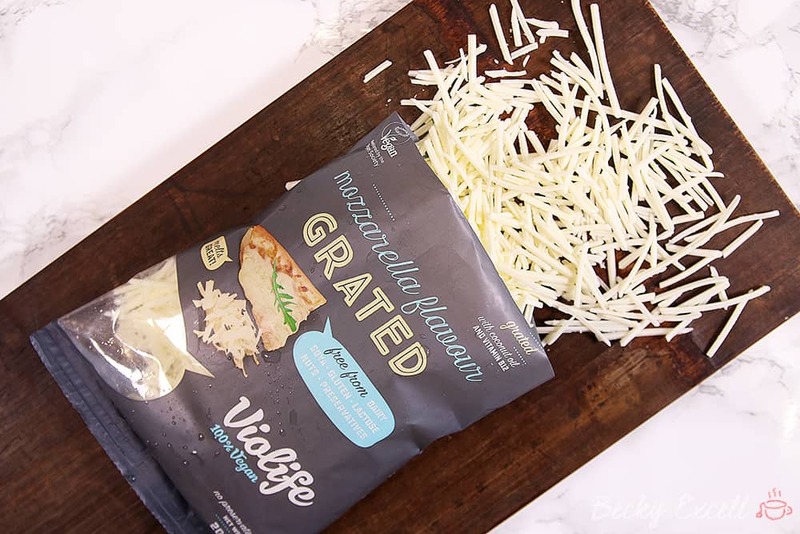 Violife’s mozzarella flavour dairy free grated cheese has rightfully earned its space as a permanent resident in our fridge. Our fridge isn’t exactly huge either! Without fail, this humble bag makes several guest appearances across the week, with a headline slot on Friday’s pizza night. And to think that Mark used to be forced to eat a cheese-less pizza in the past… how things have changed! Oh. My. Days. It wasn’t that long ago that if you wanted to make a dairy free/vegan cheese board, you’d end up with fifty shades of cheddar. Violife has really gone all out with their After Dinner range, finally allowing Mark and I to create a cheese board that truly rivals dessert. We always throw in the Violife blu block too, forming the perfect fancy cheese trio. Don’t tell anyone, but we actually ate it before dinner, not after. Hallou? It’s mi. Yep, that’s right, Violife have done it again and this vegan cheese works a treat as an alternative to Halloumi. It holds its shape really well under the grill and its taste is mild with that meaty texture you expect from real dairy Halloumi. I’ve never seen anything close to Halloumi in the dairy free world, but this… this is a total game changer. Wherever you go for lunch these days, some form of toastie/panini will make up 80% of lunch options there. How many of them are gluten free/dairy free or both? Not even a single one. It’s hard not to feel like we’re missing out! So that’s why we always make them at home in our faithful toastie maker, which we’ve nicknamed Trevor. Trevor loves Violife slices and always mentions how they’re perfect for super cheesy toasties that ooze out of every bite. We’re both totally obsessed with the smoked flavour btw and just generally enjoy taking turns to smell it once we’ve opened the packet. Trust me, it’s unreal! Yet again, Violife is the first vegan Parmesan-style cheese that Mark and I ever tried. In the cheese world, Parmesan is the king of finishing touches and this dairy free equivalent is no different. It’s intense, powerful and delivers a real punch to any Italian-inspired dish. It has that tangy quality which Mark misses so much and a little of this really goes a long way. Now if only I could get restaurants to stock this too! Violife’s creamy original flavour cheese is the ultimate spreadable, dairy free cheese. It’s so light and fluffy, yet with all the bold intensity that you’d expect from a Violife cheese. Just leave me with an endless supply of biscuits/crackers, a knife, a tub of this and I’ll be a very happy camper. 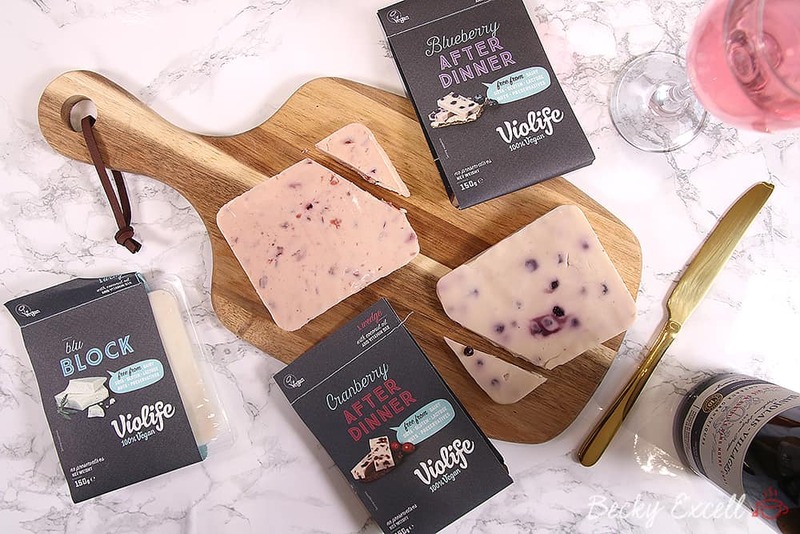 The topic of melting can often be a sore subject when it comes to dairy free and vegan cheese, but Violife have nailed it with their extra-melty cheddar block and mozzarella block. Obviously these taste great cold too, but this cheese is made to be melted. It retains its shape really well, giving that authentic gooey-like texture I know that Mark really misses in dairy free cheese. Thanks for checking out my Violife greatest hits! Violife has been a fridge favourite for Mark and I for a very long time now. I’m loving their new branding. So often free from brands forget how important branding is, but Violife have got it spot on. It really stands out on the supermarket shelf. And yes, you can grab yourself some Violife in all the major supermarkets! Have you got any personal favourites from their range? Are there any of my faves that you haven’t tried before? Please do let me know by leaving a comment below or on Facebook / Twitter / Instagram!